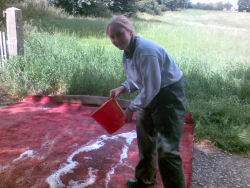 Natalie one our pet vetinary students is pictured here putting down the disinfectant on our mat at the front gate. The only humour in this is that we are using a red piece of carpet and this has attracted comments from some visitors. As all our UK readers and many of our overseas also will know FOOT AND MOUTH has reared its ugly head again. I’m not often political on these pages but the finger of blame would all too soon be pointed if it was down to farmer incompetence. I’m just hoping that incompetence is the cause and not malice. All this now after such a wet summer Grrrrrrrr. Rant over now for the report !! 33mm yes just 33mm of rain means we have finally had a drier month. It’s a long time since we have made or hay in August from memory I think 1987 twenty years ago. This years Nantwich show was cancelled but I remember the landrover being the essential form of transport back then. We have made 900 bales of hay and at time of writing half of it is stacked in the lofts the rest is still on trailers as we are progressing slowly as I’m nursing a sore foot following a cow treading on it and Simon a bad back. Second cut silage is also now in the clamp and Ill take a decision over doing a third cut depending on the weather. Sean has fitted the final roller shutter door on the shed and we now are preparing for pouring the final bay of concrete floor. We will have to be getting on with final finishing as we have a CEVAS course being held here on the 14th, 21st and 28th of November plus Hannah’s 21st birthday party on the 24th . Nothing like a deadline to keep you working. 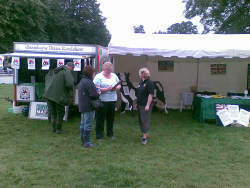 The 19th saw us in action with the roadshow at a soggy Peover game fair along with Liz and Gill from the NFU. Despite the wet we all had a busy day and the turkey chicks went down well as usual. I have worked out that 2008’s fair will be on the 17th I suspect they will only get the trailer as we have a celebration of our own for 2008. Bank holiday Monday and a new venue. 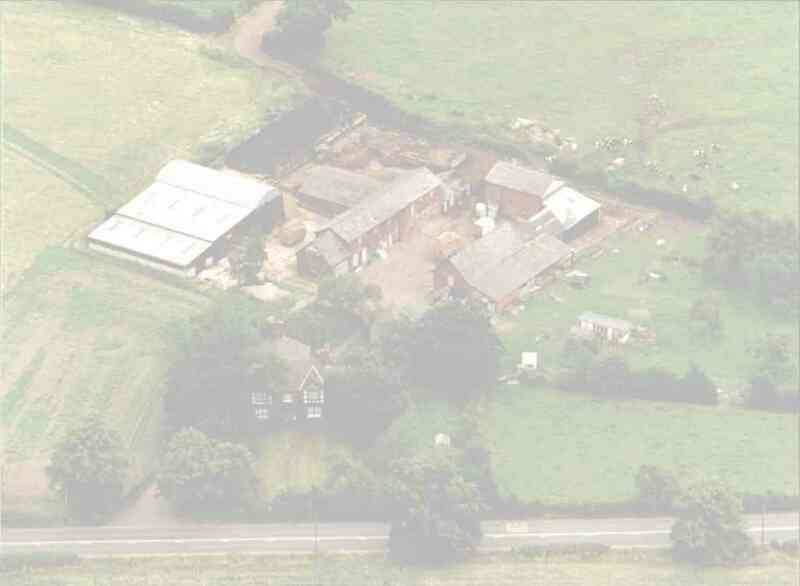 The country fayre at Heaton house farm home of our friends Mick and Margaret Heath. This was my busiest day this year and we took Dorothy and Sarah as helpers. 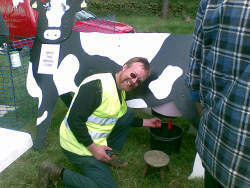 Here is Mick milking Daisy (Mick no longer has milking cows so I think he needs some practise). We were next to the main entertainments ring and amongst Shire horses and lawnmower racers we also had this bunch of nutters, the motorcycle stunt team. I think this picture says it all. Back on the farm and the tragic tale of this little calf pictured here on the seat of my landrover. She was born about 2 weeks early and was about the same size as Molly she lived for about 3 days before we suspect pneumonia killed her despite the best efforts including borrowing a lamb size bottle teat in order to feed her. Next month will see the final concrete floor poured and the oat crop harvested (providing Alan’s old combine holds together as he has had some trouble this season) Simon and Hannah back to collage and Sarah and Becky (congratulations to both on their A level success) starting theirs. See you next month PHIL ?